Our FireShield range of Automatic Fire Extinguishers are widely recognised and trusted, they have become well known for their high quality finish and reliability. These Extinguishers are designed to protect and combat fires in the engine compartments such as in a boat or large vehicle. Available as Dry Powder or Clean Agent (Halon Replacement) Automatic Extinguishers, see specifications below. Dry Powder are a very good choice to protect engine compartments such as in boats or large vehicles. Only one unit should be installed in any one compartment in order to provide the total protection required for that area. 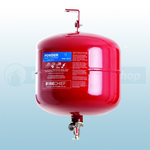 These fire extinguishers offer protection against class A, B, and C fires and are also safe to use on electrical fires. Clean Agent are a very good choice to protect computer rooms, high value assets or other delicate instrument from fire, as they leave behind no harmful residue. Only one unit should be installed in any one compartment in order to provide the total protection required for that area. The unit required is determined by the gross volume of that compartment. 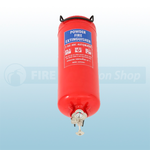 These Fire Extinguishers offer protection against class B and C fires and are also safe to use on electrical fires.